Back in February I worked with my friend Pierre Oliver to create artwork for CNR’s Form 19 and Form 31 train orders. These are essential for the Time Table and Train Order operating sessions Pierre will hold on his layout – and we used a number of the forms during Pierre’s first formal operating session last weekend. As a thank you for my help, Pierre gave me a pad of each for use on my own layout. There aren’t many occasions for writing orders and generally I don’t bother during operating sessions. But these pads will give me the option to do so when I’m in the mood for an even more realistic experience. I designed the forms based on a CNR Form 31 order that Pierre shared with me. In discussing the project and doing several tests, we determined that making them 5″ by 7″ would be close to the size of a prototype form, while still meeting the requirement of being a standard size available from a full service print shop. 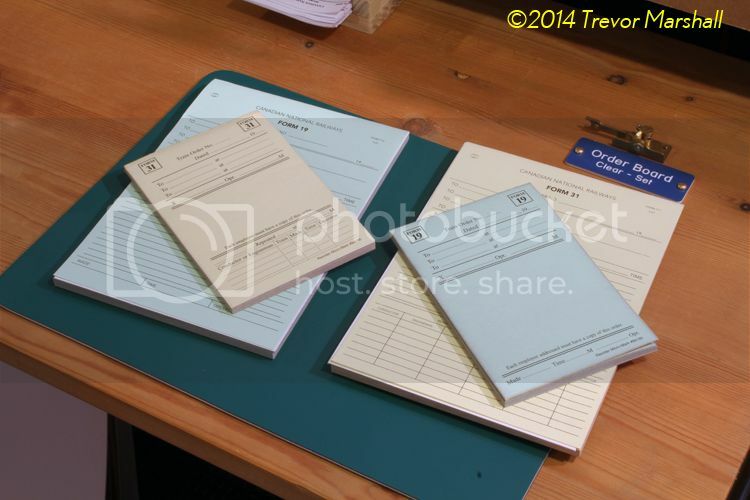 As the photo below shows, they’re considerably larger than the forms sold by Micro Mark. This is an advantage in that it makes it easier for an operator to copy a complex order from the dispatcher. Thanks Pierre – I’ll put them to good use!